Whoa! Michelle Obama’s national campaign against obesity just got a thousand times harder. Futon Animation Fulton Innovation has used the magic of SCIENCE to invent self-charging light up cereal boxes. 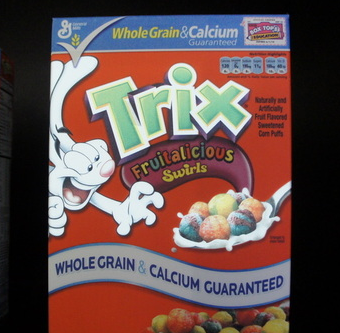 The Trix Rabbit never looked so good! At first glance, this technology is amazing. The company has also invented a self-cooking can of soup that communicates with your kitchen counter to know when to begin cooking. After the initial ooh’s and ahh’s of the video wore off, I realized this technology is going to invade our grocery stores and Hot Topic retailers in no time flat. Stock up on migraine medicine while you can. If regulated, this technology could have some absolutely wonderful uses. But something tells us this 2011 lite-brite is going to be plastered across every greeting card, every fast food cup, and every candy bar wrapper before we are halfway through the decade. Does my reluctance to admit how awesome this is mean I’m getting old? What do you think about these Honey Nut Cheeriooooooohs?